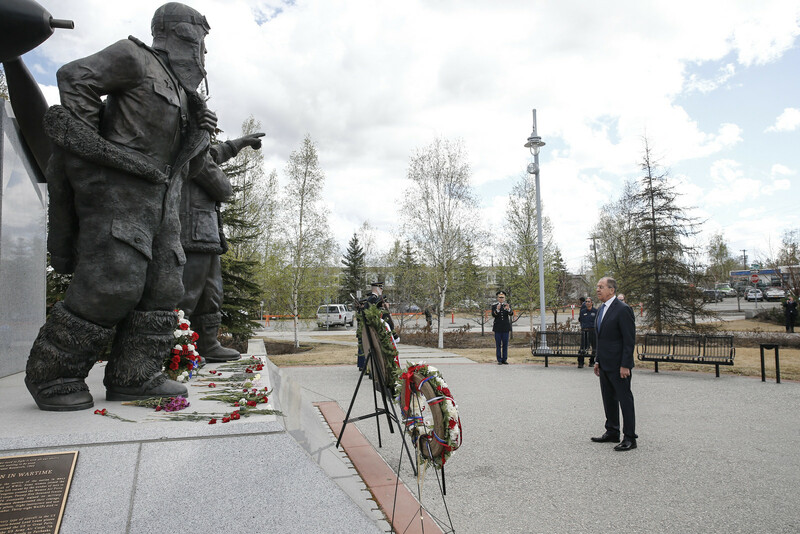 Russian Foreign Minister Sergey Lavrov took part at the flower- and wreath-laying ceremony at the Alaska-Siberia Lend-Lease Memorial in honour of Soviet and American pilots, Fairbanks, May 11, 2017. Russian Foreign Minister Sergey Lavrov, Russian Ambassador to the U.S. Sergey Kislyak and Fairbanks Mayor Jim Matherly have laid wreaths at the monument dedicated to heroes of the Alaska-Siberia (ALSIB) Lend-Lease air route, TASS reports. "It would be a shame to come here and not to visit this memorial," Russia’s top diplomat told reporters. "We appreciate the fact that Alaska residents honor the memory of our joint fight against Nazism during World War II," he added. Earlier in the day, Lavrov took part in the Arctic Council’s ministerial meeting held in Fairbanks. During World War II, Fairbanks, Alaska, was part of the air route along which aircraft were transported from the United States to the Soviet Union under the Lend-Lease agreements. This year marks the 75th anniversary of that route. From 1942 to 1945, Soviet and U.S. pilots ferried about 8,000 warplanes, which had a meaningful effect on the course of the fighting on the Soviet-German front, from that city. In August 2006, a monument dedicated to Lend-Lease and the Soviet-American brotherhood-in-arms during World War II was unveiled in Fairbanks. The Lend-Lease program and the ALSIB air route went down in history as an outstanding example of the Soviet-U.S. cooperation for the sake of the common goal of defeating Nazism.